The six National Outdoor Badges recognize a member of Scouts BSA, Sea Scout, or Venturer who demonstrates both knowledge and experience in camping, aquatics, conservation, hiking, riding, or adventure. Scouts earning the National Outdoor badges have demonstrated that they are knowledgeable, safe, and comfortable in the outdoor activity covered by the badge. 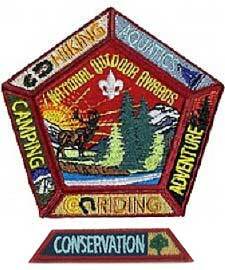 When a Scout excels in outdoor participation, there are awards to show for it! This program, conceived by the BSA's National Camping Task Force, includes a series of six badges designed to recognize a member of Scouts BSA, Sea Scout, or Venturer who has exemplary knowledge and experience in performing high-level outdoor activities. Complete 25 days and nights of camping (Sea Scouts may be on a boat), including six consecutive days (five nights) of camping , approved and under the auspices and standards of the Boy Scouts of America—including nights camped as part of requirements 1 through 3 above.YouthAs must complete six consecutive days (five nights) of the 25 nights at a BSA accredited resident camp.